A racing drone, by essence, is a small quadcopter UAV or unmanned aerial vehicle. 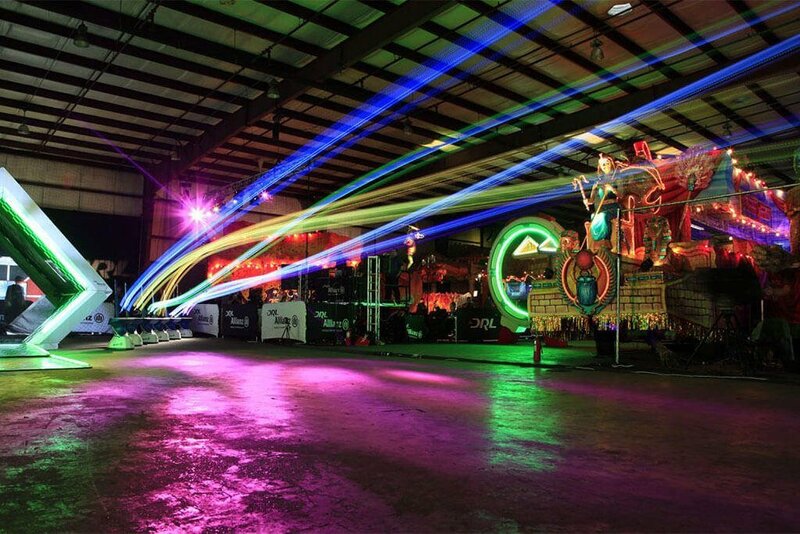 It is specifically designed to compete in first-person view or FPV racing events, most of which are held in major cities across the world. It is worth noting that racing drones are not similar to camera drones. The latter is more about being “slow and low” and is meant to capture high-quality video of real estate, surfing contests, and landscapes, just to name a few. A drone FPV racer is not capable of doing these. You might be surprised to find out that drones for FPV racing are completely different than the standard ones on the market. 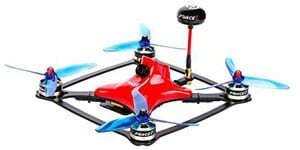 FPV racing drones are purposely built to be lighter and smaller in order to be more agile when in mid-air. Standard drones, on other the hand, are often bulky devices. Instead of having pure agility and speed – qualities that are common in a drone FPV racer – they are meant to focus more on providing a steady flight. Considering the aforementioned, it is safe to say that racing drones speak of durability despite being extremely lightweight in terms of materials used. Make no mistake, though. They are made of carbon fiber, but the sturdiness they offer is beyond expectations. Moreover, this type of drones is often paired up with enthusiast-grade receives and transmitters, both of which are responsible for annihilating any input and latency lag that could possibly occur. And since these drones offer “mushroom antennas,” you can always expect a lag-free experience when it comes to controls and live feed. A racing drone assembled straight from the box definitely offers a lot of fun. But once you have honed your skills and spent an adequate time flying, there is no doubt you are ready for the next step: working on a drone kit. A drone racing kit is simply the perfect stepping stone from playing a pre-assembled to building a racing done on your own. Although it varies from one kit to another, a DIY drone racing kit typically comes with all the necessary components. It is just up to you to build it and make it a reality. What you get really depends on the kit. While some are pretty much basic, there are those that have components required in building a quadcopter. For instance, you already have a headset and/or a transmitter. It might be best to move forward with a basic drone kit. But if you want to ensure that everything is perfect and will work accordingly, go for the full version. If you barely have the time to think about how your drone works apart from charging batteries and replacing propellers, even a drone kit can be quite overwhelming. Interestingly, once you are familiar with the components listed below, things may become a bit more manageable. Batteries – These are the ones that give power to your drone, so it can fly. While bigger batteries can provide more power, they can also weigh more. This is where you need to find the right ratio between weight and power, as it is crucial when looking for speed. Battery Charger – Obviously, you would need a charger in order to recharge the batteries once they run out. Camera – A good camera simply makes a huge difference. You can cruise without having to worry about smashing, as you can clearly see any obstacle. More importantly, it makes the flight experience more intense. Electronic Speed Controllers – The electronic speed controllers are responsible for allowing your drone to either speed up or slow down. Basically, when you use your radio transmitter to manipulate your drone’s speed, the electronic speed controllers translate the signal into the correct voltage. Once done, it immediately sends it to the motors. Frame – This one here is what gives your drone its distinctive shape. More importantly, it serves as the very base that everything else is attached to. Some frames are made of plastic, which is especially true for hobbyists who use quadcopters. If your goal is to build a racing drone, go for a frame that is as light as possible. This should make your toy fly faster, as there is less weight to haul around an obstacle. Flight Controller – This is simply your drone’s central processor, a very important component. If you want a better processing power, it is ideal to buy the more expensive ones. They do not only make your drone smarter, but they also allow it to be more responsive than cheaper ones. Goggles – Headsets can vary depending on quality and cost. For instance, you buy a headset and pay for as low as $50. The only catch, however, is that it provides pixelated images. This will likely to interfere with your ability to navigate an obstacle or course. Even more so, it significantly diminishes the pleasures of FPV flying. If you want a fully immersive experience, go with headsets that offer an amazing solution. Sure, they will cost you hundreds of dollars, but the quality and experience they provide are top-notch. Motors – As the name suggests, it powers your drone’s propellers to make it fly. 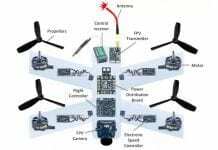 In most cases, a drone may have one motor to each propeller. This is done in order to make the drone fly much faster. Propellers – These are those spinning blades that generate lift and velocity. Although they vary from one drone kit to another, they usually come with 2, 3 or 4 blades and may differ in sizes. The Power Distribution Board – Also known as PDB, this one sends power from your drone’s battery all the way to places it needs to go (i.e. flight controller, receiver, video transmitter, etc.). Think of it as your toy’s spinal cord, which, in turn, sends electrical impulses to all working parts. Radio Transmitter – This is without a doubt the one component you do not want to skimp on. You do not just use it to communicate with your toy but also control the latter. So, as much as possible, do not be a cheapskate when looking and buying a radio transmitter. Video Transmitter – A video transmitter is what sends images that are captured by your drone’s camera to the video receiver found in your headset. Some video transmitters are designed to allow users to change channel and frequency, among other features.. There is actually an interesting logic why many have chosen to build their own drone from scratch. If you are the type who simply loves to experiment or venture on a new path, then this is reason enough to get you started. For starters, you always have the advantage to either modify or replace some parts and replace each one of them with something you think is of better quality or performance. 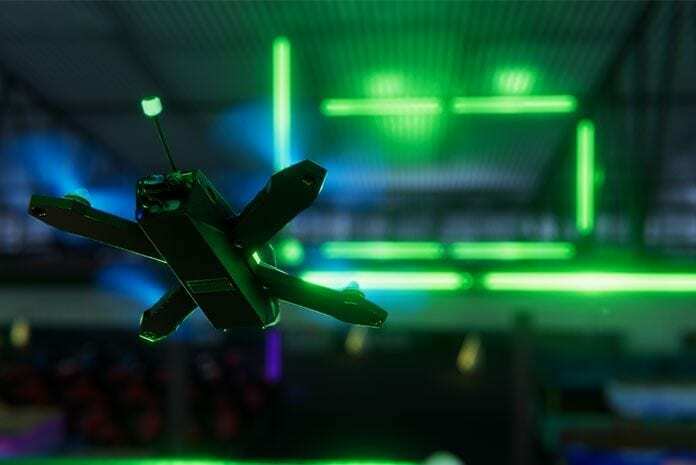 Add to this the fact that a drone racing kit can teach you more about how your drone works and, at the same time, how it can be controlled for optimal results. But like everything else, though, there are always pros and cons. A Sense of Self-Achievement – Building a drone on your own can give you a revered feeling of achievement and success. This is most especially once you see it fly after building. Upgrading Purposes – As mentioned above, using a racing drone kit allows you to replace and/or change parts with something new and improved. If you purchase a pre-built drone, there is no way for you to upgrade it, let alone replace it for better performance. Enriches learning – This is definitely one of the coolest things about making your own drone. It simply enriches your learning experience. As you watch how everything works coordinate, you eventually acquire knowledge on how to assemble, fix, and replace parts. It Can Cost You A Bit – Let’s be honest here: building a drone turns is just straightforward costlier than buying one. That is because you have to buy all the accessories yourself and, more often than not, they tend to be expensive when bought separately. Since you want to make a sturdy drone, you want to go with high-quality parts. And yes, they are usually more expensive. Time and Patience Consuming – When you are out there building a drone from scratch, you will not only need an ample of time. You will also need patience – a lot of it. And mind you, it is not something that you can just complete in a single sitting. It will really require hours. So unless you have the patience, it might not be a good idea to buy a DIY drone kit. No Guarantees – Just because you built a drone from a drone kit, it does not mean it would fly. There is always a chance that it will go the other way around. And yes, it can really be disheartening. This is most especially the case if you find a defect or a broken part. You Must Have The Technical Know-How – There is a reason why buying a drone kit is not highly-encouraged for first-timers. You see, building from scratch requires a good amount of technical expertise. It is not something that you can learn overnight. Keep in mind that you will be making and calibrating the drone on your own. Sure, you can obtain knowledge from various online tutorials and YouTube videos, but most are things that you need to learn on your own. Now that you clearly know and understand what drone kits are for, it is time to check some of them. Thanks to its versatility, this drone racing kit is easily a favorite for beginners. And oh, there is an RTF (ready-to-fly) package if you are interested. ImmersionRC’s Vortex 285 Racing Quad – This is arguably among the best RTF/FPV models on the market right now. Although it is a bit bigger than the common 250s, it is still a fast drone. With its foldable design, transportation becomes a piece of cake. The ImmersionRC’s Vortex 285 Racing Quad is designed specifically for both beginners and intermediate racers and beginners. Arris FPV 250 – There is a reason why this one is a great steal amongst racing drone kits available. It boasts robust carbon fiber composition mixed with glass fiber for superb durability. It is so durable that it can withstand any accidents or crashes. Although its letdown is having to buy a remote and battery separately, it is a great drone kit for all types of hobbyists. Woafly LHI 220 Quadcopter Kit – Whether you ask a beginner or an experienced drone builder, they will all agree that this racing drone kit has the best quadcopter frame. From the brushless DX2205 2300kv motor to the F3 flight controller board, your money is certainly going further with this drone. It has all the hardware you need. This kit does not come with instructions, but there are tons of instructions available on YouTube to get you started. Hobbypower DIY 250 Mini Quadcopter H 250 Racing Drone Frame Kit – This DIY drone kit has one of the strongest sets of components on the market. They are all strong and durable. More importantly, they offer a smooth flight structure, making them a top choice for kids to play. In fact, this is the perfect kit for beginners. That is because this model can help first timers think and understand the very concepts of the hobby. To start your flight with this drone, you will need a separate battery and remote control. It is also ideal to have a 1000-1800mah power supply with you. Racing Drones – What is so cool about them?